A simple, but comfortable studio casita situated half way up the steep hill to the Mayan village of Santa Cruz, so about a 10 min walk from the public dock. 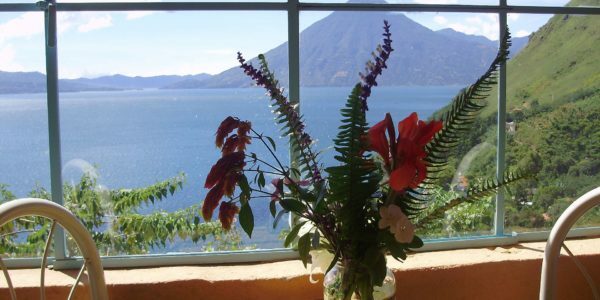 Once you get to the house you will be blown away by the views of Lake Atitlan and its famous volcanoes! A small terrace area plus a covered porch open up into the main open-plan living, bedroom & kitchen area, with the bathroom and shower in a separate room. There is a double bed, plus desk area for working and the light is wonderful for those who might want to paint for example! This is a perfect rental for a volunteer or someone wanting to Get Away from it all to write, paint, or just simple Chill Out! Santa Cruz is a very popular village to live and rent in, as it is only accessible by boat (10-20 mins from Panajachel – Pana), but is the closest village to Pana by boat. Pana is the commercial and transport hub of Lake Atitlan. Here is where you find: banks, ATMs, grocery stores, local market, pharmacies, cafes, internet cafes, bars, restaurants etc. However, the lake shore of Santa Cruz, where most of the foreigners live, has at least 4 hotels that have restaurants, and every Saturday there is a Farmer’s Market at La Iguana Perdida Hotel, right next to the public dock. NO INTERNET. But Tigo USB mobile sticks work well here. From $170/month – min. 1 month Up amongst the tree tops and banana trees of Santa Cruz are 2 rustic, ..
From $200/month long term (if pay for 6 months in advance) – Min. 1 month – Available until end Oct 17 ..
CR-2011: Lower Sta Cruz Studio Casita, Perfect for Volunteers!